There are many perspectives and opinions floating around in the marine world that characterize low speed running or low loading of a diesel engine will adversely affect its life.. I also have my own opinions on this subject and these are based solely upon my 30 years of experience and observations in the field mixed in with some printed guidelines from Cummins Engine Company. I do have a strong opinion that with a NEW engine, break-in and operation should follow any printed guidelines from the manufacturer. In the absence of these (seems like most cases), break-in for the first few hours should consist of a mix of short time (5-15 seconds) full power use, along with at least 10-25 % of these first few hours at 70-80% of full power.. On generator applications, I recommend that 70-100% load be applied soon after start-up and the attempt be made to maintain a high load for the first 20-100 hrs of operation. The above has proven to me that if there may have been a concern about ring seating or glazing cylinder walls, that this type of use has mitigated this potential problem. The practice of using relatively high loads during break-in has also helped in finding problems with the rest of the equipment and systems on the boat..Don’t forget, most new engines follow a repower or come in a new boat that have many other NEW things to, literally, “break” or “break-in”…The sooner I find these “breaks”, the better for all from my perspective..
As for life expectancy on a typical modern high speed diesel engine (probably an old one too), when run at 10-50 % of its rated hp, you’ll get longer life (substantially in many cases) when measured in engine hours, everything else being equal..As a general statement, Detroit diesels of WWII design built their “long life” reputation on running slow..Most of my work in the last few years has been replacing Detroit 2-strokes in commercial vessels with Cummins C series engines that are set up to run at approx 30-40% of their rated hp when cruising for long/extended periods. This WILL allow these engines to accumulate approx 20,000+ hrs of engine time before rebuild due to ring/cylinder, head and bearing wear.. 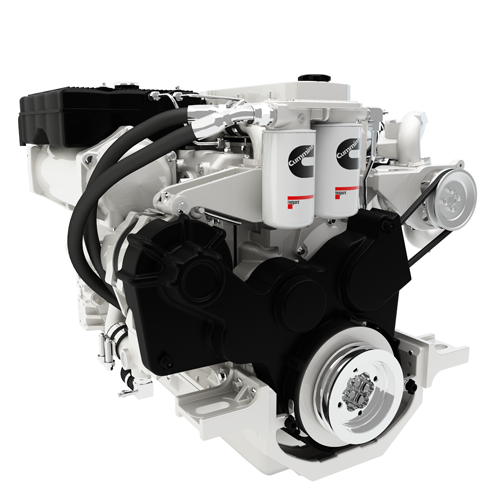 The Cummins 6BT 210 is a 10,000 hr+ engine in an application that lets the engine cruise at about 50-60% of rated HP with the remainder of the hours between idle and 50% of load.. I’m also making the assumption that the engine doesn’t fail due to maintenance/installation problems. I personally own a 4BT (2 cylinders less than a 6BT) that had a “top- end” at 13000 hrs and is now approaching 30,000 total hrs and still has all of the original base engine parts in it.. By far, most of its hours have accumulated at well under 50% of its rated HP. To me, the easiest way to gage whether slow speed running is detrimental over years and years of operation is to look at commercial fishing vessels with older designed engines from Detroit, Cat, Cummins, etc… Revisiting the “Detroit” mystique again, its longevity was built on engines rated to run at 1900-2100 RPM and above, but could only last for 30+ yrs when operated continuously at 1100-1600 RPM (again, well under 50% of rated HP)..These same engines in a “crew” boat used in the off-shore oil industry, would go through “top-ends” (or worse) just about yearly when run at close to their governor settings..The longest-lived engines that I’ve been involved with (hrs and yrs wise), have been engines in commercial or recreational trawler type applications run at 50% of rated HP or less..Yes, there are many other parts of the equation that leads to the life of a diesel engine, but I know from experience that running them slow (i.e. cruising for days on end at hull speeds or less) is NOT a cause for concern. But some obvious things to watch out for (when running slow) are being sure your coolant temp stays up to spec. and watching for any signs of wet stacking or slobbering..Some Detroits seem to do this, but I think it’s more of the general condition of that particular engine and is sometimes related to the design of the exhaust system.. A few minutes a day at higher cruise HP levels should be all that is necessary to clean things up should it be needed.. In closing, I’ll mention that although this topic is brought up quite often and many people preach that you’ve got to use a diesel hard if you want it to last, I’m still waiting to find one that was rebuilt before its time due to low speed use..Just the opposite seems to be always the norm.